The FCC is seeking comment on issues involving expanded use of various radar applications in the 76-81 GHz band, which Amateur Radio shares with other services. The band 77.5-78 GHz is allocated to the Amateur and Amateur Satellite services on a primary basis, and to the Radio Astronomy and Space Research services on a secondary basis. "We undertake this proceeding to expand the available spectrum for radar operations in the 76-81 GHz band," the FCC said in a detailed Notice of Proposed Rulemaking and Reconsideration Order (NPRM&RO), released February 5 in ET Docket 15-26. The Commission said the proposals include allocation changes as well as provisions "to ensure that new and incumbent operations can share the available frequencies in the band." The FCC NPRM&RO is in response to a Petition for Rulemaking (RM-11666) filed in 2012 by Robert Bosch LLC and to two petitions for reconsideration of the Commission's 2012 Report and Order (R&O) addressing vehicular radar systems in the 76-77 GHz band. ET 15-26 incorporates earlier proceedings. Among many issues, the FCC seeks comment on the possibility of reallocating the Amateur Radio and Amateur Satellite services from 76-81 GHz, and it asks for suggestions on "alternative spectrum that we might make available in this general region." Bosch's 2012 Petition sought to modify the FCC's Part 15 rules to expand the operation of unlicensed vehicular radar systems from 76-77 GHz to the 76-81 GHz band to develop short-range radar (SRR) applications. The Bosch petition received "general support from the automotive industry," the Commission said. In its petition, Bosch said that it anticipated no interference issues between Amateur Radio operations and vehicular radar operations at 77-81 GHz. "It notes that it is unconvinced after several meetings with the technical staff of ARRL that there is any 'significant incompatibility,'" the FCC NPRM&RO recounted, "and describes how amateur operations in the band 'tend to be largely experimental, occurring in geographic areas such as mountaintops and other rural areas where motor vehicle operation is not typical.'" The FCC noted, however, that it "has previously recognized evidence of potential interference conflicts" between Amateur Radio and vehicular radar systems in the 76-77 GHz band, and believes the potential for "similar compatibility issues" could exist above 77 GHz. More than 10 years ago the FCC suspended Amateur Radio and Amateur Satellite operation in the 76-77 GHz segment and recently extended the suspension. "Our goal is to adopt rules that address amateur use, including Amateur Satellite use, within the 76-81 GHz band in a comprehensive and consistent manner," the FCC asserted. 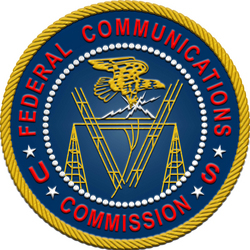 The FCC said that to the extent commenters believe Amateur Radio can continue to use the 4 millimeter band, it seeks comments on "what additional rule modifications we would have to adopt to realize successful shared use of the entire band." One possibility the FCC raised was altering current amateur power limits in that portion of the spectrum. The Commission said it also wants to "develop a record on the types of amateur use, and the extent of such use, that is currently undertaken" at 4 millimeters. The ARRL plans to comment in the FCC proceeding. K1N team member Glenn Johnson, W0GJ. fierce with little letup, K1N team member Glenn Johnson, W0GJ, said in a February 10 media release. A day earlier, during a satellite telephone interview with Wolf Harranth, OE1WHC, Johnson advised phone operators to turn off their speech processors when trying to break the pileups. He said the splatter generated when phone ops max out their audio in an effort to be heard "makes it almost impossible" to pick out individual callers. "If we could somehow magically eliminate all speech processors, we could probably double or triple our rate, particularly in working Europeans," Johnson told OE1WHC. Johnson said the distribution of K1N contacts forms "almost a bell-shaped curve centered on 20 and 30 meters," although, he added, 40 meters has been "very productive" as well. On the outer edges, K1N had logged more than 2500 contacts on 160 as of February 9 and has been working stations in Oceania and Europe on 6 meters, where K1N has been maintaining a beacon on 50.103 MHz. K1N CW operator Ralph Fedor, K0IR, works down a pileup. Johnson said the team will continue to operate full bore into the early weekend but will start closing down on Friday, February 13, sending unneeded supplies back to Jamaica. "We'll probably be in full swing through Friday evening (local time)," Johnson explained. Operations will proceed through Saturday, but "at the break of dawn" on Sunday, February 15, the team will have to depart Navassa, and it could be another decade before anyone is able to activate Navassa Island. "Everyone is still healthy and in good spirits," Johnson said in the team's February 10 news release. "We really thank everyone for standing by while we work our propagation windows, especially to Japan." The K1N logs have been posted. 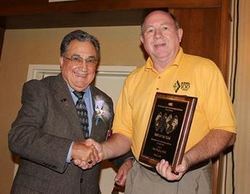 New Nevada SM John Bigley, N7UR (right), receives the ARRL Pacific Division "Ham of the Year" award from Pacific Division Director Bob Vallio, W6RGG. who died February 1 after a period of ill health. Field Services and Radiosport Manager Dave Patton, NN1N, consulted with Pacific Division Director Bob Vallio, W6RGG, and made the appointment effective on February 5. Bigley has been serving as an Assistant Section Manager and as the Public Information Coordinator for Nevada. He edits the Nevada Amateur Radio Newswire. Bigley will complete Grant's remaining term of office, which concludes on June 30. 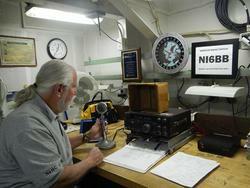 Bigley was selected as the 2014 ARRL Pacific Division "Ham Of The Year." ARRL is now soliciting nominations for the next 2-year term of office for Nevada Section Manager, which starts on July 1. Nominating petitions are due at ARRL Headquarters by March 6, 2015. Details are available on the ARRL website. The complete 2015 ARRL Field Day packet is now online. There are no rule changes for 2015. Field Day 2015 takes place June 27-28. "Following a successful Centennial QSO Party with on-the-air activity at an all-time high, we are very excited for this year's event and hope that individuals and clubs will carry their enthusiasm over to Field Day," said ARRL Contest Branch Manager Matt Wilhelm, W1MSW. ARRL Field Day is the most popular on-the-air event held annually in the US and Canada. On the fourth weekend of June, more than 35,000 radio amateurs gather with their clubs, groups, or simply with friends to operate from remote locations. Participants are encouraged to register their Field Day operations using the FD Site Locator. Field Day gear will be available by March 1. If you have questions about Field Day, e-mail them, or call 860-594-0232. 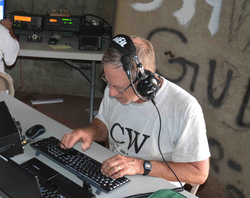 CW, DXing, and contesting come together and go global February 21-22 for the 2015 ARRL International DX CW contest. This HF contest season has seen incredible high-band conditions and record entry numbers, and as it draws to a close, this is a terrific opportunity to get on the air and get in on the fun. It's the US and Canada working the world in this event. If you have never operated in a CW contest, the event's short and simple exchange, combined with abundant stations on the air, makes it an ideal opportunity to try something new. Participating in the ARRL DX CW is a fantastic way to hone your CW operating skills and expand your knowledge of HF propagation. DX stations around the world will be looking to work US and Canadian stations, so don't miss this chance to put a "new one" in your log. 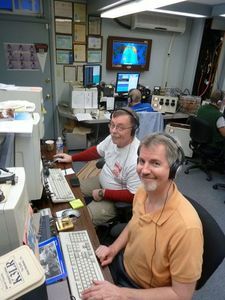 At the top-scoring K3LR MM in 2014, W5OV (L) and K3UA seem to be enjoying themselves working the pileups. Think your station is too small to operate in one of the largest contests of the year? Think again. There are Low Power and QRP categories, and, if the improved solar conditions we saw at the end of 2014 continue, there will be plenty of stations for "Little Pistols" to work. Keep an eye on 10 meters, which can be a great place to find a quiet slice of spectrum to run on low power. Stations in the US and Canada work only DX stations (Alaska and Hawaii are considered DX for this contest), while DX stations work only the US and Canada. The contest exchange is simple: US and Canadian stations send a signal report and their state or province, while DX stations send a signal report and their power output. The contest gets under way at 0000 UTC on Saturday, February 21 (the evening of Friday, February 20, in US time zones) and continues through through 2359 UTC on Sunday, February 22, 2015. Complete rules and forms are on the ARRL website. E-mail electronic logs (Cabrillo format). Mail paper logs to ARRL DX CW Contest, 225 Main St, Newington, CT 06111. Logs must be received or postmarked no later than 2359 UTC on Tuesday, March 24, 2015. The Amateur Radio on the International Space Station (ARISS) program has announced another round of Amateur Radio slow-scan television (SSTV) activity from the International Space Station will take place later this month. Transmissions will be from RS0ISS. 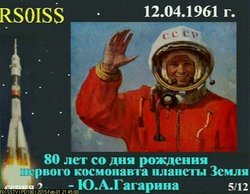 John Sweigart, KK4SHF, received this SSTV image from RS0ISS of Soviet space pioneer Yuri Gagarin on February 1. RS0ISS will begin on February 21 at 1000 UTC and end on February 23 at 2130 UTC. The SSTV mode will be PD180, which can produce high-quality images with a frame scan of 187 seconds. Twelve different images depicting Soviet space pioneer Yuri Gagarin -- the first human to orbit Earth -- will be sent on 145.800 MHz, with a 3-minute off time between transmissions. Received images may be uploaded to the image gallery. During the last round of SSTV transmissions from RS0ISS, a Polish radio enthusiast, 22-year-old Radoslaw Karwacki, used an RTL-SDR "dongle" to pick up the SSTV signals from the ISS. The tiny software-defined receiver, which plugs into a computer USB port and includes an antenna port, cost about $15. He used a basic dipole and free software to receive and display the images. "I blindly tuned in on that frequency during ISS flyby and happened to receive the signal," he told Daily Mail Science and Technology reporter Jonathan O'Callaghan. "This is an excellent example of how low cost systems can be employed by students to copy pictures directly from the ISS," said ARISS International President Frank Bauer, KA3HDO. "We are working on additional picture downlinks over the course of the year using images from our international team. Our next initiative is a series of pictures of 'spaceflight inventors,' including Tsiolkovsky, Goddard, Oberth, Von Braun, and others." AMSAT-UK has posted a report on the last round of SSTV transmissions in late January and early February. MichaÅ Zawada, SQ5KTM, and a Polish team of radio amateurs who received signals from the ARTSAT2: DESPATCH (FO-81) spacecraft while it was more than 1.68 million miles from Earth have been rewarded with a QSL generated by a 3D printer. Zawada reported that the team heard FO-81 on December 9. One half of the "card" is a 3D depiction of the sculpture ARTSAT2 carried into deep space; the other half is a printed reception confirmation. The two-part QSL included a 3D printer image representing the ARTSAT2 sculpture sent into deep space (left) and a more conventionally printed reception report. "The last signals received by us from ARTSAT2: DESPATCH were very weak, but clearly stood out on the waterfall diagram of the monitoring program," he reported. "To avoid misinterpretation we asked for confirmation directly from the creators of the space probe -- Tama Art University and The University of Tokyo." Zawada said the data he and his team reported were analyzed, compared with the model and successfully authenticated, "and we have received confirmation with thanks." He said the team sent "gigabytes of data" to the operators of the ARTSAT2 and Shin'en-2 space probes for further analysis. The Industrial Research Institute for Automation and Measurements (PIAP) loaned the use of its 4.5 meter parabolic mesh dish and the help of some employees to the project; the team used its own Amateur Radio equipment. "Preparations of our ground station took us almost 2 weeks, including some hours on a roof at freezing weather conditions," Zawada reported. ARTSAT2: DESPATCH and Shin'en 2 (FO-82) were launched on December 3 with the Hayabusa 2 asteroid sample-return mission. ARTSAT2: DESPATCH carried a 7 W CW transmitter on 437.325 MHz and included the first sculpture ever to be carried into deep space. The spacecraft transmitted for approximately 1 month before going silent. Read more. The FCC Enforcement Bureau has imposed a reduced fine of $3000 on a Florida, CB operator for failing to allow FCC agents inspect his station. The Commission issued Tommie Salter of Jacksonville a Forfeiture Order on February 5. Last August the FCC had proposed fining Salter $14,000 for denying agents from the FCC's Tampa Office permission to check out his station in the wake of renewed complaints of interference to a neighbor's "home electronic equipment." 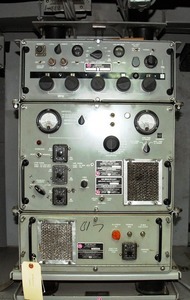 In March 2014, agents monitored radio transmissions on 27.245 MHz and used radio direction-finding techniques to track the signal's source to Salter's residence. The FCC said it agreed to reduce the proposed forfeiture based on Salter's financial circumstances. "Mr Salter does not deny that he refused to allow the agents to inspect his CB station but alleges he could not stay for the inspection, because he had a doctor's appointment," the FCC Forfeiture Order said. The Enforcement Bureau said it was unable to substantiate Salter's appointment claim but said that he could have asked to reschedule the inspection in such a situation. The Bureau concluded that it could "find no reason to reduce the forfeiture based on his alleged appointment." The FCC said financial documents that Salter provided offered "sufficient basis" to reduce the forfeiture to $3000. "We have previously rejected inability to pay claims in cases of repeated or otherwise egregious violations," the Commission added. "Therefore, future violations of this kind may result in significantly higher forfeitures that may not be reduced due to Mr Salter's financial circumstances." The FCC's Forfeiture Policy Statement and its rules set a base forfeiture amount of $7000 for failure to permit inspection. Salter had previously received a Notice of Violation for refusing an inspection request in 2004, the Notice of Apparent Liability for Forfeiture (NAL) in the case noted, and he also had been fined for operating with a non-certificated transmitter during restricted hours the Commission had imposed following similar interference complaints. Read more. Electronics retailer RadioShack, which once supplied Amateur Radio equipment and has continued to maintain an inventory of electronics components, has reached an asset purchase agreement with General Wireless Inc, an affiliate of RadioShack creditor Standard General, to acquire up to 2400 of RadioShack's more than 4000 company-owned stores. Many, but not all, RadioShack stores will close, as the Fort Worth, Texas-based company attempts to restructure under Chapter 11 bankruptcy following 11 quarterly losses. General Wireless has agreed in principle on terms with Sprint to establish a new dedicated mobility "store-within-a-store" retail presence in up to 1750 of the acquired stores. Stores that are closing are expected to sell remaining inventory. It's a massive project on a number of levels, but the so-called "Gray Radio Gang" that's been working to restore some of the vintage US Navy radio gear on board the Battleship Iowa (BB-61), docked in Los Angeles, recently fired up one of the vessel's transmitters for the first time in about 25 years. Restoration team member Jim Jerzycke, KQ6EA, recounted on his "Every Blade of Grass" blog how the group was finally able to get 950 W into a dummy antenna from one transmitter on 20 meters. "We still have quite a way to go before we attempt to put one [transmitter] on the air, but the results were quite encouraging for at transmitter that was last powered up sometime in 1990," Jerzycke said in his blog. "BB-61 should be on the air later this year with a big voice!" He told ARRL that, once transmitters are deemed operational, they probably would not be used very often on the ham bands. The Iowa already has a ham radio station, NI6BB, under the auspices of the Battleship Iowa Amateur Radio Association (BIARA), an ARRL-affiliated club. BIARA's president is Doug Dowds, W6HB. 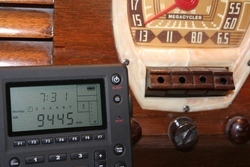 NI6BB has more modern gear but makes use of the ship's own antennas. The BIARA is active from the Iowa most Wednesdays and for many national holidays, such as Veterans Day, Pearl Harbor Day, and Memorial Day, and for operating events such as the Museum Ships Weekend and International Lighthouse/Lightship Weekend. The station also has hosted Boy Scouts' Jamboree On The Air (JOTA) groups each fall. 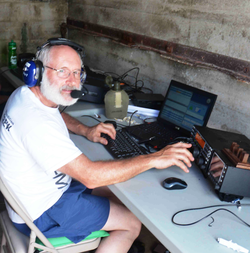 Arnold Shatz, N6HC, at the helm of the Iowa's NI6BB club station. Jerzycke said the Gray Radio Gang is composed of about 10 individuals with experience on various types of US Navy radio gear dating from the 1950s to the 1980s, when most of them served in the Navy. "At 63 years old, I'm one of the 'youngsters' in that group," he added. The team has been trying to get the original receivers, transmitters, RTTY gear, and antennas working again, Jerzycke said. "We are very fortunate in having the guys from the aircraft carrier Midway in San Diego and the Battleship New Jersey in Camden, New Jersey, who have provided us with technical help, documents, and spare parts." The AN/URT-23(C) transmitters, he joked, are "built like a battleship," with a pair of 4CX1500Bs in the final and nominally capable of putting out a couple of kilowatts. He noted that once the Gray Radio Gang has confirmed the signal paths for the various shipboard transmitters and receivers, it will be able to put a transmitter/receiver pair in operation for certain special events. "At this time it's unlikely that we will use the original radio equipment for 'routine' Amateur Radio operations, as it's very manpower intensive, requiring at least six people to operate," Jerzycke explained. "It's an honor and a privilege to be able to work on the Iowa, and I enjoy every minute of it!" The Department of Homeland Security's Office of Emergency Communications will offer its Auxiliary Communications (AuxComm) course May 12-14 prior to Hamvention® 2015 in Dayton, Ohio. 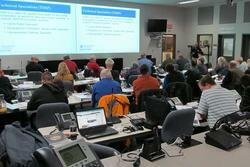 More than 1000 Amateur Radio operators have completed the course, which trains qualified hams to assist local, county, and state government with emergency backup communication. The AuxComm course covers emergency communication in a public safety context within the National Incident Management framework. It also introduces the auxiliary communicator to the Communications Unit Leader function. Details and regist ration requirements are available on the Hamvention website. Applicants must meet all prerequisites and provide documentation to attend this class. The class is limited to 50 qualified students. The intensive 3-day course provides facilitated lectures, student exercises, and interactive discussions. World Radio Day, February 13, Will See Inauguration of Special 4U0ITU Call Sign: ITU International Amateur Radio Club station 4U1ITU in Geneva will mark World Radio Day on Friday, February 13. This event also kicks off the International Telecommunication Union's (ITU) 150th anniversary. International Amateur Radio Union President Tim Ellam, VE6SH, will inaugurate special call sign 4U0ITU at 0900 UTC. He will be accompanied by ITU Secretary General Houlin Zhao, other elected officials, and VIPs. The IARC will use the 4U0ITU call sign until World Radiocommunication Conference 2015, November 2-27, 2015. World Radio Day commemorates the first broadcast of UN Radio in 1946. All 4U0ITU contacts will be confirmed. QSL information is available on QRZ.com. Winter SWL Fest Set for February 27-28 near Philly: The North American Short Wave Association's 28th Annual Winter SWL Fest will be held February 27-28 at the Doubletree Guest Suites in Plymouth Meeting, near Philadelphia, Pennsylvania. The Winter SWL Fest is a conference for all radio hobbyists, and it attracts medium wave, scanning, satellite TV, and Amateur Radio enthusiasts. ARRL Southern New Jersey Section Manager Skip Arey, N2EI, will deliver a presentation, "Regenerative Receivers Past and Present," during the gathering. Arey is the author of the Radio Monitoring: The How-To Guide. Other forum topics will include "Pirate Radio," "Ultralight Medium-Wave DXing," and "Crisis Communications." Additional information is on the NASWA website. Worked All Wisconsin Counties Applicants May Claim Wisconsin QSO Party Contacts: The West Allis Radio Amateur Club has announced that applicants for its Worked All Wisconsin Counties (WAWC) award now may claim Wisconsin QSO Party contacts for award credit. The West Allis Radio Amateur Club sponsors both activities. The Wisconsin QSO Party takes place March 15-16 UTC). For 2015, WAWC applicants may claim Wisconsin QSO Party contacts without a QSL card. Applicants must indicate QSO Party contacts on the entry form, and the club will utilize the QSO Party database to confirm these. Brazil Forms an AMSAT Organization: An AMSAT organization has been formed in Brazil (AMSAT-BR), as a special-interest group under the Liga de Amadores Brasileiros de Radio Emissão (LABRE), the national International Amateur Radio Union member society. AMSAT-BR was established "to better organize Brazilian Amateur Satellite activities, to better represent the Amateur Radio community to organizations developing CubeSat projects, and to attract more amateurs in different regions of the country to join our cause," LABRE Executive Director Orlando Perez Filho, PT2OP, told AMSAT-NA. The primary missions of AMSAT-BR will be to foster activities related to development, building, operating, and monitoring Amateur Radio satellites and high-altitude balloons, as well as activities using these in STEM education. Read more. Free Android Propagation Tool Available: WSPR World Watch is a free Android app that plots real-time radio transmission paths on a world map and incorporates a background display of the gray line or terminator. It was developed by Derek Turner, G4SWY. Users may view paths of individual stations, and there is an aurora plot option and display of space weather indices. WSPR is designed for probing radio propagation paths using low-power, beacon-like transmissions. WSPR signals convey only a call sign, Maidenhead grid locator, and power level. Receiving stations with Internet access automatically upload reception reports to a central database. Tad Cook, K7RA, Seattle, reports: We saw solar indices drop this week. Average daily sunspot numbers dropped from 139 to 81.6, while average daily solar flux went from 151.1 to 144.1. Geomagnetic indices were more stable this week, with average daily planetary A index going from 14.7 to 8.4, and average mid-latitude A index declining from 9.4 to 6.6. The two 7-day periods compared here are January 29 through February 4, and February 5-11. Predicted solar flux for the near term is 140 for February 12-14, 130 for February 15-16, then 125, 135, 150, and 145 for February 17-20, 140 for February 21-22, 145 for February 23-26, 150 for February 27-28, 145 on March 1, 140 for March 2-7, and 135 for March 8-10. Solar flux then reaches a low of 125 for March 12-13, a high of 140 for March 16-17, and heads back to 125 for March 21-22. Predicted planetary A index is 8 for February 12-14, then 10, 12, 10, 8, and 10 for February 15-19, 5 for February 20-21, 15, and 12 for February 22-23, 10 for February 24-27, 20 for February 28 through March 1, 15 on March 2, 10 for March 3-4, 5 for March 5-6, 8 on March 7, 10 on March 8, and 8 for March 9-12.